"I think it's important to really understand where you're coming from, understand who your peers are, who your community is," DACA recipient and future Rhodes Scholar Jin Park says. This year's list of Rhodes Scholars is remarkable for many reasons. Almost two-thirds of the recipients are women and nearly half are first-generation Americans or immigrants. But one scholarship winner in particular made history this year. Harvard University student Jin Park has become the first recipient of Deferred Action for Childhood Arrivals — DACA — to earn a prestigious Rhodes Scholarship. Park, 22, arrived in New York City with his parents from South Korea when he was 7 years old and grew up in Queens, N.Y. Park is currently a senior at Harvard working toward a degree in molecular and cellular biology with a minor in ethnicity, migration and rights. Thanks to the Rhodes Scholarship, Park will continue his studies at the University of Oxford in Oxford, England next year. "I've proposed two master's degrees for my studies at Oxford: one in migration studies, the other in global health science and epidemiology," Park says. "I want to do those two degrees and come back and hopefully work in the context of public health department ... [to] implement evidence-based policies to improve and work on immigrant health." NPR's Scott Simon spoke with Park about what the scholarship means to him and to other DACA recipients. Scott Simon: What does this scholarship mean to you? Jin Park: It means to me personally a lot because growing up as an undocumented person in New York City, I've had a lot of formative experiences around particularly how my parents were treated at the face of the law and how I personally experienced some of these social institutions. And so, these experiences as a childhood informed a lot of the ways that I wanted to use my talents for the world. And so having this opportunity for me is really meaningful. You were a speaker at the 2018 Harvard Class Day. I want to read you your words as I read them: "If you've ever eaten at a Korean Restaurant or received a mani-pedi in New York City, congratulations. Like it or not, you may have partially subsidized the education of what Fox News would call an illegal alien." So, my dad works as a line cook and restaurant and my mom worked in beauty salons her entire life. So, kind of watching my parents do that combined with also seeing my parents get denied health care, access to health care, health insurance, those experiences have informed the fact that if you're an undocumented person in America, you don't really have a full shot at full opportunity. So that's kind of what I wanted to impart to my classmates. How do you feel about this country? Strangely, I feel really optimistic. I think regardless of the occupant of the White House, it's important to keep the focus on some of these bigger questions — who belongs in America? Who is American? And who are we going to provide the full benefits of membership in America? These are really big, almost theoretical questions that are going to remain. The answers are going to be necessary even after the current occupant leaves the White House. So, I think the real implications of the answers to these questions are important. They have genuine real consequences for immigrants. So, I think that's where we really have to to keep the focus. You have words for other DACA recipients who might be anxious about what's going on in this country now? The biggest thing that I'd say is understand your roots, stay true to your roots. I think it's real important to really understand where you're coming from, understand who your peers are, who your community is, who you want to serve, because going forward I think that's where you draw your strength. I draw my strength, personally, from visiting my dad in the restaurant and kind of touching his hand and feeling the blisters and the roughness of his hands and that always reminds me that I have to keep the focus on our community. That's where I have to always come back. So that's the kind of advice that I'd give: Stay true to your roots. This year's list of U.S. Rhodes Scholars is remarkable for many reasons. Almost two-thirds are women. Nearly half are first-generation Americans or immigrants. But one scholarship recipient has specially made history this year. 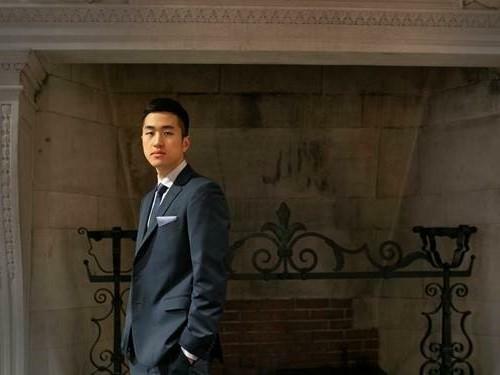 Jin Park, a student at Harvard, and he is the first recipient of Deferred Action for Childhood Arrivals, or DACA, to receive one of these prestigious scholarships to study at Oxford University. Jin Park arrived in New York City with his parents when he was 7 years old. He joins us now from Queens. Thanks so much for being with us. JIN PARK: Thanks for having me. SIMON: Well, congratulations. Forgive me - did your parents cry? PARK: Yeah, they did. They cried. I also cried. We all cried (laughter). SIMON: Well, help us understand what it means to you. I don't have to tell you - I mean, Bill Clinton, Susan Rice, Bobby Jindal. What does this scholarship mean to you? PARK: It means to me personally a lot because growing up as an undocumented person in New York City, I've had a lot of formative experiences around particularly how my parents were treated at the face of the law and how I personally experienced some of these social institutions. And so these experiences as a child informed a lot of the ways that I wanted to use my talents for the world. And so having this opportunity for me is really meaningful. SIMON: And how do you want to use your talents for the world? PARK: I've proposed two master's degrees for my studies at Oxford - one in migration studies, the other in global health science and epidemiology. And so I want to kind of do those two degrees and come back and hopefully work in the context of a public health department in New York City or a large metropolitan area and implement evidence-based policies to improve and work on immigrant health. SIMON: I have a feeling, Mr. Park, we're going to be talking to you for years to come. PARK: I hope so, yeah. SIMON: You were a speaker at the 2018 Harvard Class Day. I'm going to read you your words as I read them. SIMON: Quote, "if you've ever eaten at a Korean restaurant or received a mani-pedi in New York City, congratulations, like it or not, you may have partially subsidized the education of what Fox News would call an illegal alien." PARK: Yeah. So my parents - so my dad works as a line cook in a restaurant, and my mom worked in beauty salons her entire life. And so kind of watching my parents do that combined with also seeing my parents get denied health care - access to health care or health insurance - those experiences have informed the fact that if you're an undocumented person in America, you don't really have a full shot at full opportunity. And so that's kind of what I wanted to impart to my classmates. SIMON: And how do you feel about this country? PARK: Yeah. I feel - strangely, I feel really optimistic. I think regardless of the occupant of the White House, it's important to keep the focus on some of these bigger questions, right? Who belongs in America? Who is American? And who are we going to provide the full benefits of membership in America? So these are really big kind of almost theoretical questions that are going to remain. The answers are going to be necessary even after the current occupant leaves the White House so - and I think the real implications of the answers to these questions are important. They have genuine, real consequences for immigrants. So I think that's where we really have to keep the focus. SIMON: Do you have words for other DACA recipients who are - might be anxious about what's going on in this country now? PARK: Yeah. The biggest thing that I'd say is understand your roots. Stay true to your roots. I think it's real important to really understand where you're coming from, understand who your peers are, who your community is, who you want to serve because going forward I think that's where you draw your strength. So I draw my strength personally from visiting my dad in the restaurant - right? - and kind of touching his hand and feeling the blisters and the roughness of his hands. And that always reminds me that I have to keep the focus on our community. That's where I have to always come back. And so that's the kind of advice that I give. Stay true to your roots. SIMON: Jin Park, soon-to-be Rhodes Scholar and a Harvard grad, thanks so much and good luck to you. PARK: Thanks for having me. Transcript provided by NPR, Copyright NPR. In a federal courtroom in Texas today, the debate over the Trump administration's immigration policies shifted from separated families to another group of young immigrants. They are the ones who were brought to the United States as children and grew up here. 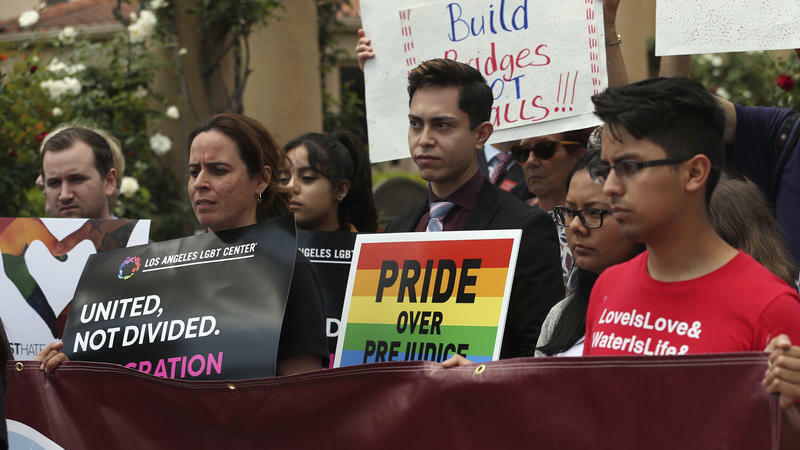 About 700,000 young people were protected from deportation under the Obama-era program called Deferred Action for Childhood Arrivals, or DACA. Dozens of immigration activists rallied outside a Broward immigrant detention facility Thursday against the federal government's policies. Chanting "up, up with liberation, down, down with deportation," the protestors called for the abolition of the U.S. Immigration and Customs Enforcement, ICE, and for an end to the detention of undocumented immigrants. Signs and chants targeted private contractors like The Geo Group, which runs goverment detention facilities.